Obtaining highly sensitive and highly specific antibodies is challenging for researchers. Many antibodies that are used in experimental assays have limited validation behind them, and the data given by the provider are not always lot-specific. Consequently, researchers must often independently validate antibodies, a time-consuming and costly process. Validation standardization - Every new lot is tested using the same stringent criteria and compared to the previous lot before adding to the catalog. 2. Up to 20 rabbits arre immunized. Each rabbit is injected 6 times. Four bleeds are taken from each rabbit. 3. All bleeds are tested by ELISA and WB. Antibodies against modified histones are also tested for specificity against different peptides with related modifications by dot blot. 5. The purified antibodies are again tested in ELISA, dot blot and WB. 6. Purifications that pass this QC are pooled together giving a final lot, which is again tested. The specificity of antibodies against modified proteins (e.g. histones) is tested by dot blot. The signal obtained with the specific peptide should be >70% of the total signal on the blot for the highest peptide concentration. Most of our antibodies against histone modifications exceed expectations with a specificity of >90%. To test the cross reactivity of the Diagenode antibody against H3K4me1 (Cat. No. 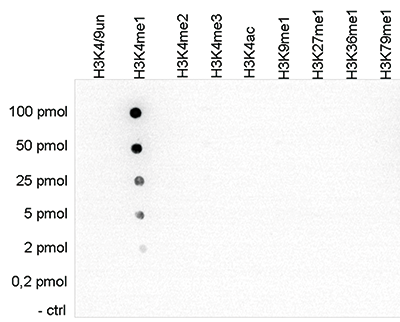 C15410194), a Dot Blot analysis was performed with peptides containing other histone modifications and the unmodified H3K4. One hundred to 0.2 pmol of the respective peptides were spotted on a membrane. The antibody was used at a dilution of 1:5,000. Figure 1 shows a high specificity of the antibody for the modification of interest. The specificity of antibodies against modified histones is further tested on peptide arrays. These arrays contain 384 different peptides in duplicate with different combinations of H3, H4, H2A and H2B modifications. A specificity factor >30 and at least 5x higher than for any other modification is required to pass this QC. The specificity of the antibody was demonstrated by peptide array analyses on an array containing 384 peptides with different combinations of modifications from histone H3, H4, H2A and H2B. The antibody was used at a dilution of 1:2,000. Figure 2 shows a high specificity for the peptides containing the H3K4me3 modification. The specificity of antibodies against non-histone proteins is further tested by siRNA knockdown. If the antibody that recognizes the protein of interest is specific, the Western blot of siRNA-treated cells will show a signal reduction of at least 60% compared to untreated cells, as shown by the results below. 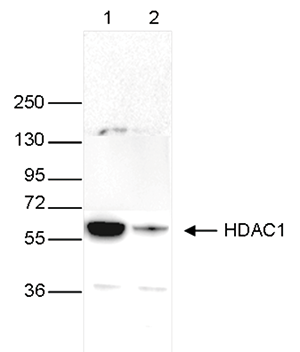 Whole cell extracts (40 μg) from HeLa cells transfected with HDAC1 siRNA (lane 2) and from an untransfected control (lane 1) were analysed by Western blot using the Diagenode antibody against HDAC1 (Cat. No. C15100144) diluted 1:1,000 in TBS-Tween containing 5% skimmed milk. The position of the protein of interest is indicated on the right (expected size: 55 kDa); the marker (in kDa) is shown on the left. Antibodies are validated in IF and DAPI is used in parallel to stain the nucleus of the cells. 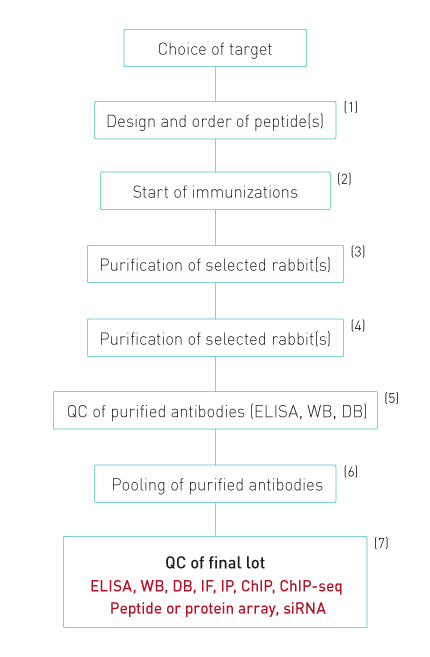 Peptide blocking with specific and related peptides prior to the incubation is used for many antibodies against histone modifications. Epigenetic antibodies should only show a nuclear signal and this signal should disappear only after incubation with the specific peptide. IF using the Diagenode H3K4me1 antibody (Cat. no. 15410194), diluted 1:200 after incubation with 4 different blocking peptides (H3K4un, H3K4me1, H3K4me2 and H3K4me3). The image shows the merged staining with the antibody (green) and with DAPI (blue). The green signal only disappears after blocking with the H3K4me1 peptide. ChIP is performed according to our standardized protocol. qPCR is performed using at least 2 positive and 2 negative control targets. To pass the ChIP QC, the antibody has to show the expected profile with a +/- ratio >5. ChIP assays were performed using human HeLa cells, the Diagenode antibody against H3K4me3 (Cat. No. C15410003) and optimized PCR primer pairs for qPCR. ChIP was performed with the “Auto Histone ChIP-seq” kit (Cat. No. C01010022), using sheared chromatin from 1 million cells. A titration consisting of 1, 2, 5 and 10 μg of antibody per ChIP experiment was analyzed. IgG (2 μg/IP) was used as a negative IP control. Quantitative PCR was performed with primers specific for the promoter of the active genes GAPDH and EIF4A2, used as positive controls, and for exon 2 of the inactive myoglobin (MB) gene and the Sat2 satellite repeat, used as negative controls. The figure shows the recovery, expressed as a % of input (the relative amount of immunoprecipitated DNA compared to input DNA after qPCR analysis). These results are in accordance with the observation that trimethylation of K4 at histone H3 is associated with the promoters of active genes. ChIP for ChIP-seq is performed on sheared chromatin with one of the Diagenode ChIP-seq kits. Extensive bioinformatic analysis is applied on the obtained data and, if available, the results are compared to publicly available data (Encode). An antibody passes the QC if it shows the expected profile with an overlap of >90% for the top 40 most significant peaks and a %RIP at least as high as obtained with published data. ChIP was performed on sheared chromatin from 1 million HeLaS3 cells using 1 μg of the Diagenode antibody against H3K4me3 (Cat. No. C15410003) as described above. The IP’d DNA was subsequently analysed on an Illumina Genome Analyzer. Library preparation, cluster generation and sequencing were performed according to the manufacturer’s instructions. The 36 bp tags were aligned to the human genome using the ELAND algorithm. Figure 7 shows the peak distribution along the complete sequence and a 600 kb region of the X-chromosome (figure 7A and B) and in two regions surrounding the GAPDH and EIF4A2 positive control genes, respectively (figure 7C and D). These results clearly show an enrichment of the H3K4 trimethylation at the promoters of active genes.